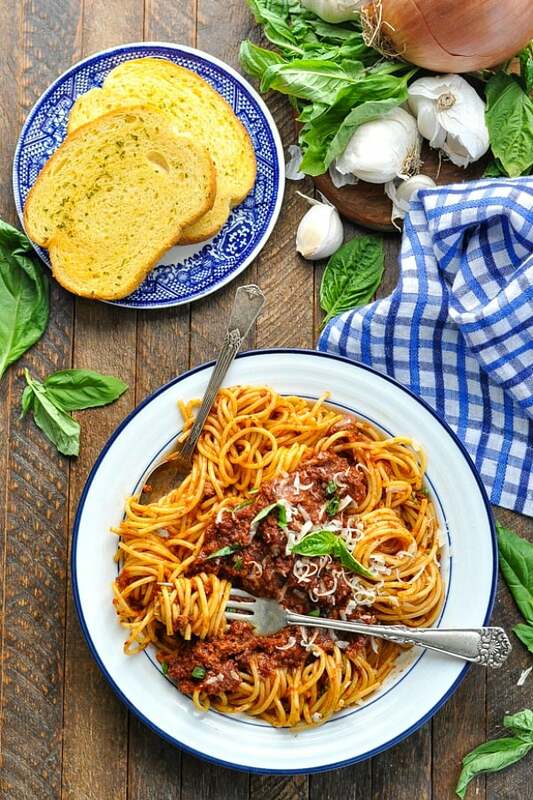 Mom's recipe for a hearty and healthy Spaghetti Meat Sauce is always a family favorite! 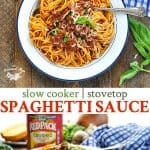 The simple spaghetti sauce can be prepared on the stovetop or in the Crock Pot for a cozy, easy dinner on chilly nights! This post is sponsored by Redpack Tomatoes. 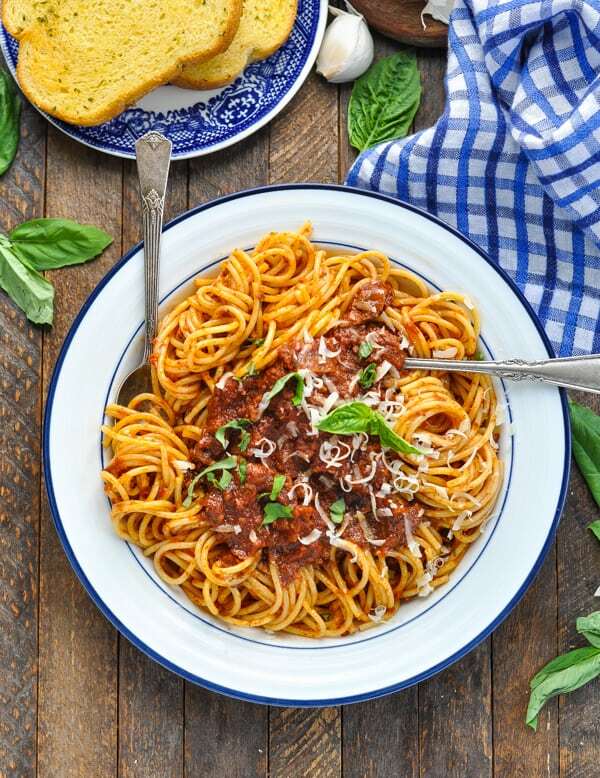 Mom’s recipe for a hearty and healthy Spaghetti Meat Sauce is always a family favorite! The simple spaghetti sauce can be prepared on the stovetop or in the Crock Pot for a cozy, easy dinner on a chilly night! After a snowy day of sledding or a long day at the office, there’s nothing better than coming home to a warm pot of Italian spaghetti meat sauce simmering on the stovetop. 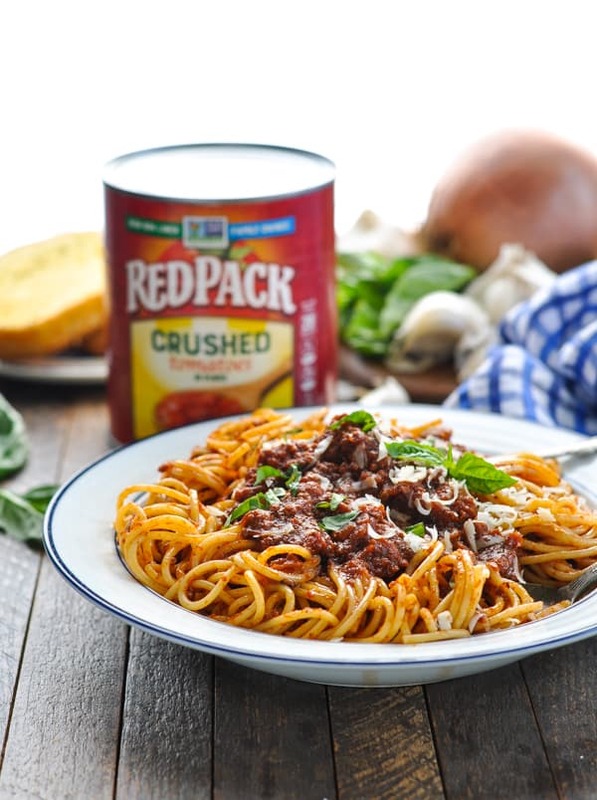 This wholesome blend of ground beef, herbs, and the finest Redpack Tomatoes is perfect over a bowl of pasta. 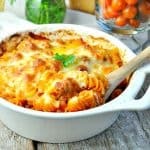 Best of all, it’s one of the few easy dinner recipes that all 3 of my kids can agree on! 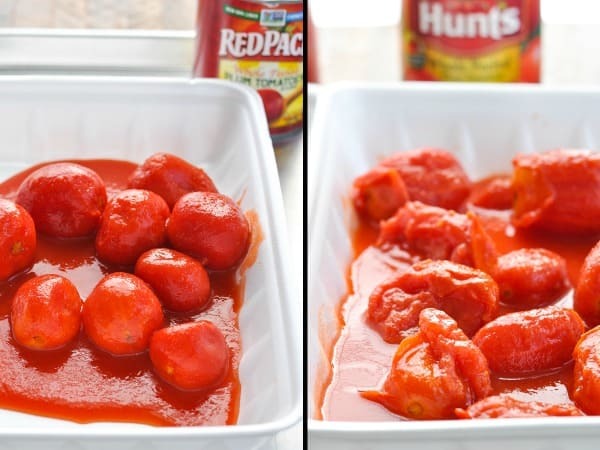 I’m proud to be partnering with Redpack Tomatoes to share this recipe with you today, because they truly are the best tomatoes! When you’re preparing a tomato-based spaghetti sauce, you obviously want to use the most flavorful ingredients. That’s why I performed a little experiment to demonstrate exactly why Redpack makes the freshest, best tasting tomato products in the world! When I dumped the two different brands of tomatoes into side-by-side trays, the Redpack Tomatoes (below left) were bright red, uniform in size, and completely round and intact. By contrast, the Hunt’s tomatoes looked like varying sizes of mush. I don’t need to be a scientist to decide which brand of tomato I want to use in my mom’s easy meat sauce recipe! 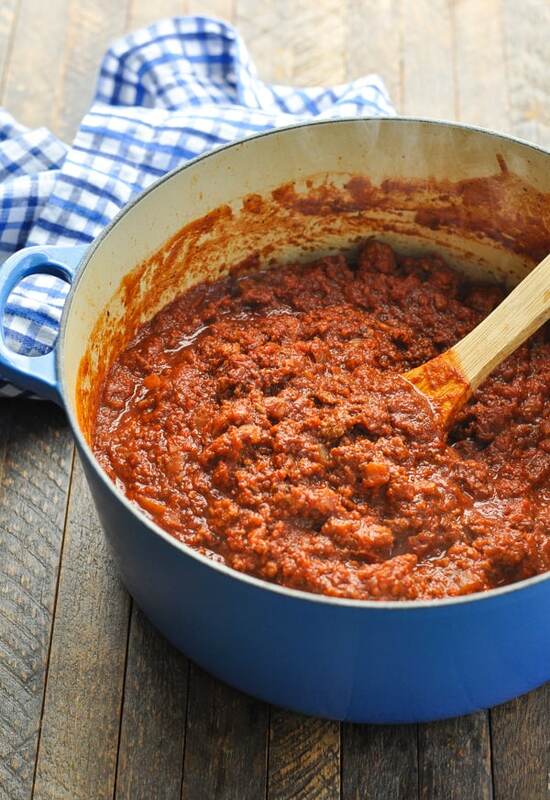 How do you make the best meat sauce? With the best ingredients, a rich, flavorful and simple spaghetti sauce comes together easily! First, cook ground beef, onion and garlic in a Dutch oven (or large stockpot) until the meat is no longer pink. Drain off the fat. Next, add the remaining ingredients — starting with the tomatoes! 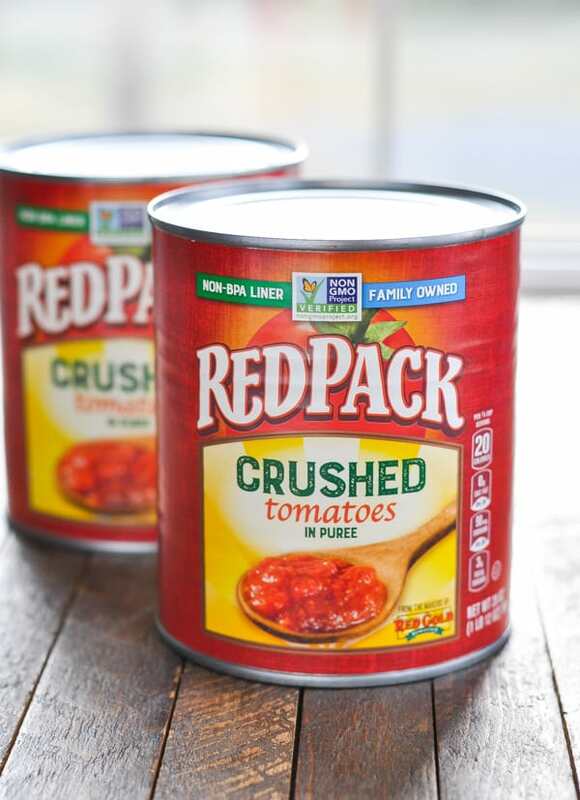 I used 2 cans of Redpack Crushed Tomatoes, along with Redpack Tomato Paste. This sauce is full of fresh, rich flavor! 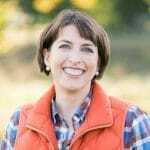 As I mentioned above, I prefer the Redpack tomatoes not only because they offer the best quality on the market, but also because they are family-owned and sustainably grown on Midwest family farms. 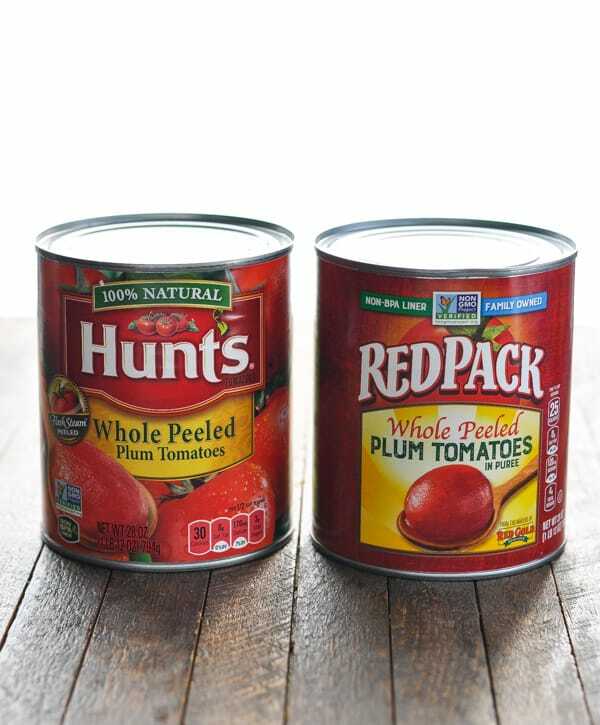 The tomatoes are steam packed fresh, non-GMO Project Verified and come packed in Non-BPA/BPS lined cans. Love that! 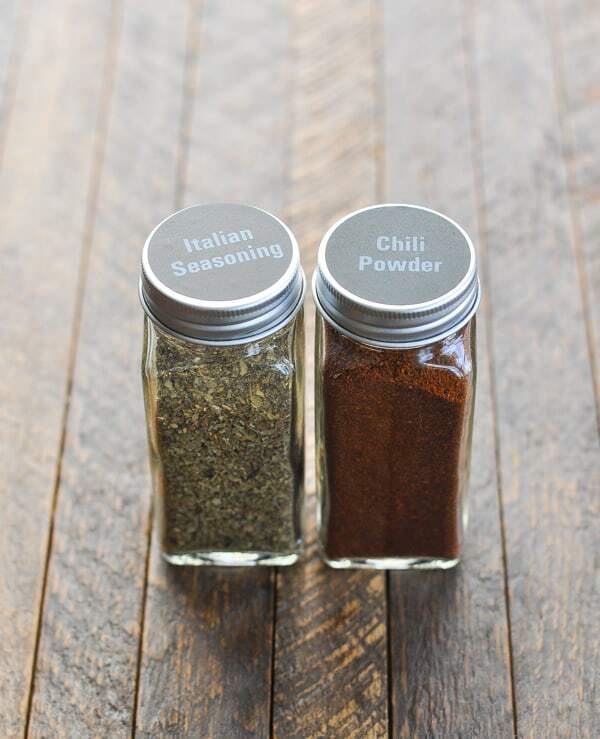 Italian seasoning and chili powder. Put a lid on your pot and let the stove do the rest of the work! Isn’t that easy? The spaghetti meat sauce simmers for about 2-3 hours over very low heat. Stir it occasionally, and be sure that the heat isn’t too high. You don’t want the sugars in the tomatoes to scorch the bottom of your pot (which will give your sauce a burnt taste). If you prefer to prepare your spaghetti meat sauce recipe in the slow cooker, those instructions are included below. 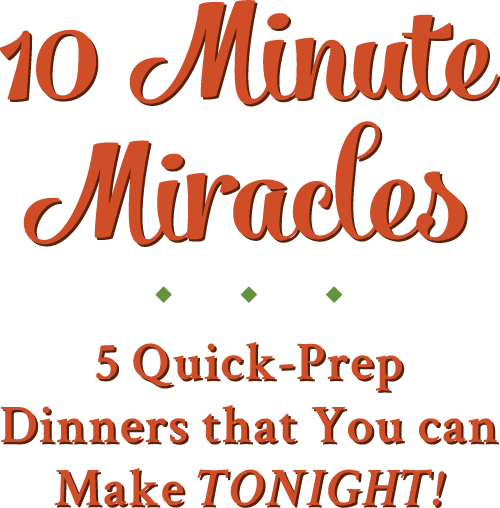 You will simmer the sauce in the Crock Pot on LOW for about 6-8 hours. Can you freeze Spaghetti Meat Sauce? Yes! This is a perfect freezer meal! 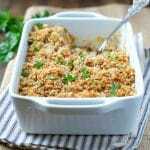 The recipe yields a large batch, so store leftover sauce in an airtight container in the freezer for up to 3 months. 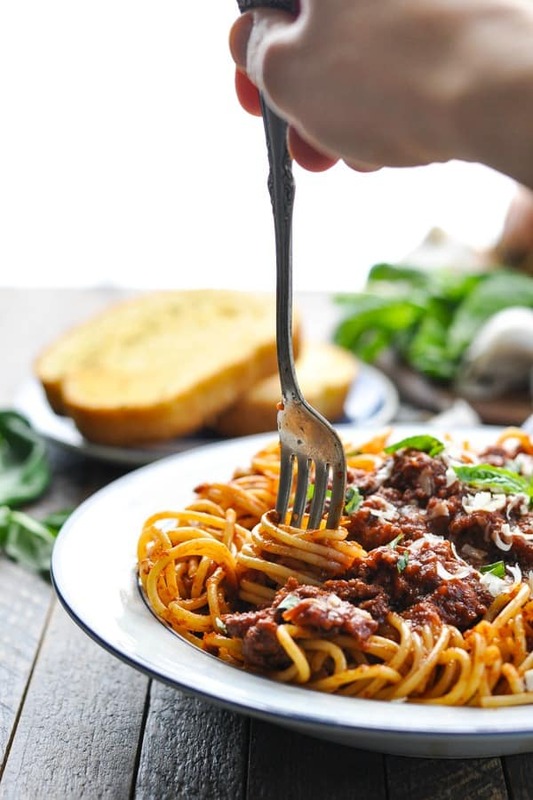 How long can Spaghetti Meat Sauce last in the fridge? The meat sauce will keep in the refrigerator for 3-4 days. 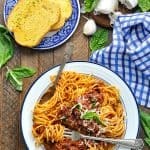 Is Spaghetti Meat Sauce healthy? Yes! I like to use lean (or extra lean) ground beef, which offers plenty of satisfying protein. The tomatoes and other vegetables that comprise the base of the sauce are full of an antioxidant called lycopene, which has been linked to many health benefits, including reduced risk of heart disease and cancer. 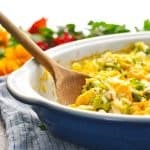 The tomatoes are a great source of vitamin C, potassium, folate and vitamin K.
This is one of those special recipes that the kids adore, and that you can feel good about serving to your family! While my mom always prepares this meat sauce with ground beef, you can substitute Italian sausage for half (or all) of the beef called for. If you want a spaghetti meat sauce with ground turkey, simply substitute 2 lbs. of ground turkey for the ground beef. For an even lighter option, try serving your meat sauce over zucchini noodles. My mom makes her spaghetti meat sauce with mushrooms, so feel free to add sliced mushrooms to your pot! 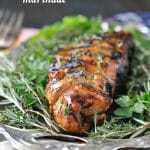 I omitted them from my recipe because my kids prefer the sauce without the mushrooms. I like the rich flavor of the spaghetti meat sauce with red wine. Don’t worry — the alcohol cooks off! That said, if you would rather not use wine in this recipe, you can substitute with an equal amount of beef broth. I list “sugar” as an optional ingredient. Sugar balances the acidity of the tomatoes, so I typically include about 1-2 teaspoons (to taste) when I’m making a pot of sauce. When cooking the sauce on the stovetop, be careful to simmer the sauce over very low heat. Stir occasionally, as well. This will prevent any scorching in the bottom of your pot. Heat about 1 tablespoon of olive oil in a large skillet or Dutch oven over medium-high heat until the oil is shimmering. Add the onion, garlic and beef to the skillet. Cook, breaking up the meat with a wooden spoon, until the beef is no longer pink. Drain off the fat. Transfer beef mixture to a slow cooker. Add tomatoes, tomato paste, Italian seasoning, chili powder and red wine. Cover and cook on LOW for about 6-8 hours. Season with sugar (optional), salt and pepper, to taste. Serve with cooked spaghetti and garnish with fresh basil and grated Parmesan cheese. Heat about 1 tablespoon of olive oil in a large pot or Dutch oven over medium-high heat until the oil is shimmering. Add the onion, garlic and beef to the skillet. Cook, breaking up the meat with a wooden spoon, until the beef is no longer pink. Drain off the fat. Add tomatoes, tomato paste, Italian seasoning, chili powder and red wine. Cover and simmer over low heat for 2-3 hours. Season with sugar (optional), salt and pepper, to taste. Serve with cooked spaghetti and garnish with fresh basil and grated Parmesan cheese. 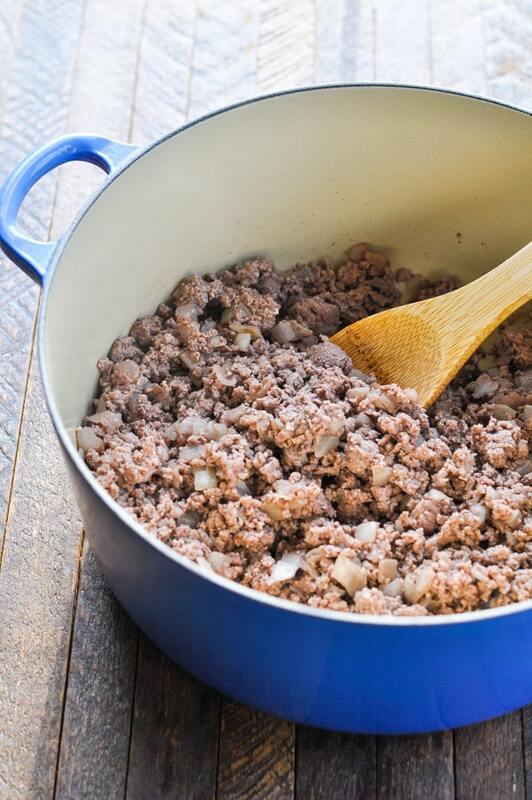 While my mom has always prepared this meat sauce with ground beef, you can substitute Italian sausage for half (or all) of the beef called for. If you want a spaghetti meat sauce with ground turkey, simply substitute 2 lbs. of ground turkey for the ground beef. I like the rich flavor of the spaghetti meat sauce with red wine. Don't worry -- the alcohol cooks off! 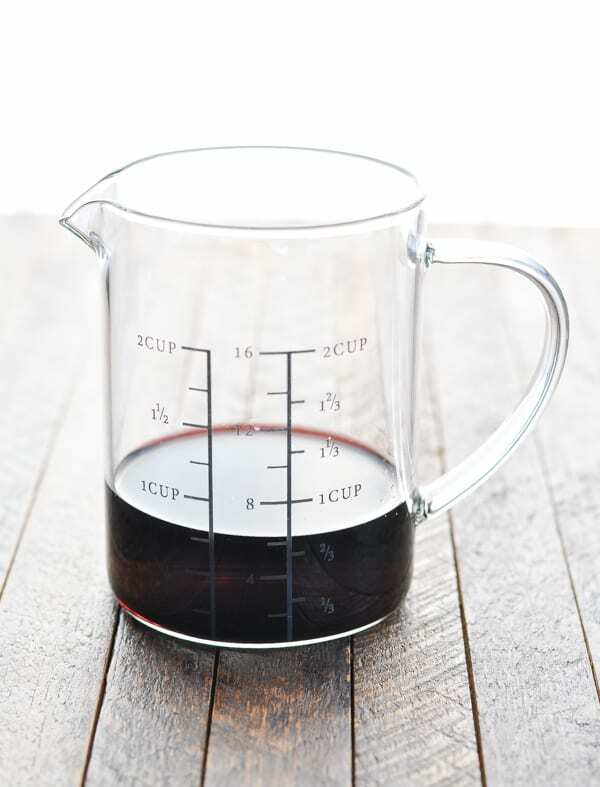 That said, if you would rather not use wine in this recipe, you can substitute with an equal amount of beef broth. I list "sugar" as an optional ingredient. Sugar balances the acidity of the tomatoes, so I typically include about 1-2 teaspoons (to taste) when I'm making a pot of sauce. Blair this sauce is the BEST. 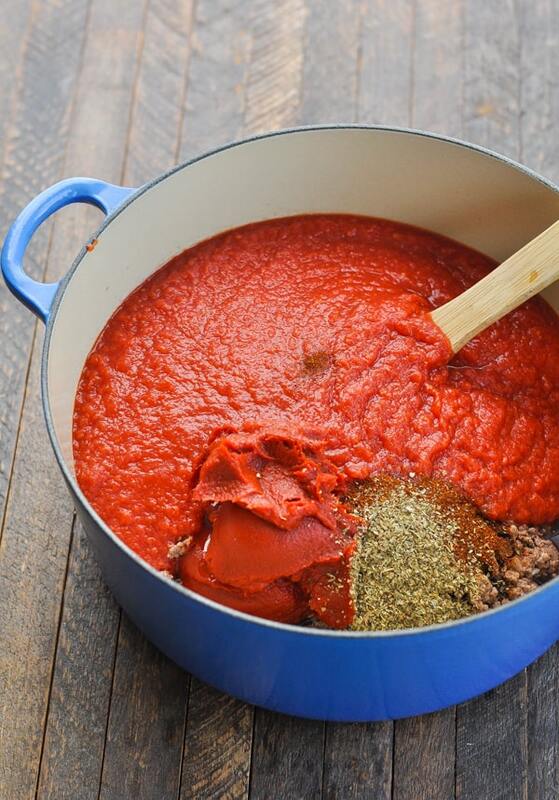 And so easy…this is my new go-to homemade pasta sauce! WOW!